The murder of Azadiya Welat staff Kadri Bağdu back in October 2014 remains unsolved. The investigation case dossier was kept secret by a court order until last month got classified in the “unsolved murders” after that; daily Evrensel reported. Unsolved cases with no suspects or progress in the investigation get a “permanent search order” which in practice it means they are shelved as cold cases. Lawyer Tugay Bek said they will take the matter to the consideration of the Constitutional Court as the Bağdu family legal team and they are sure Bağdu is killed by ISIS related militants. Bek told Evrensel that the court order for secrecy was removed due to their appeal on January 7; they demanded a copy of the investigation dossier on January 11 and the case was shelved on January 12. Bek said the murder is definitely a terrorism related act but the authorities insist on treating it as a regular murder case. Local press reports say the body of Kurdish journalist Rohat Aktaş was identified Wednesday among the dead collected from a basement in the middle of the clashes at southeastern Turkey between Kurdish rebels and Turkish security forces. Turkey has been conducting intense anti-terrorism operations at urban areas for months while both sides of the clashes either blame each other for hundreds of civilian deaths or conflict on who is a civilian or not. Aktaş, responsible news editor for the Kurdish language daily Azadiya Welat (Homeland’s Freedom), was at a hot zone in Cizre District of Şırnak Province and had to take shelter at a basement of a building with others after being shot. Ambulances could not approach the area and everybody in that basement got killed due to heavy weaponry employed. Thousands of people from Cizre and other similar towns had to flee from their homes. According to reports, the bodies collected from the basement were burnt beyond recognition and DNA tests were applied for identification. CPJ has contacted Azadiya Welat and expressed concern for the well being of the journalist. According to the daily, Aktaş has been there for 80 days; was shot in the arm on January 22 and they did not have contact with him for days. During that time, Cizre was a forbidden zone which led to conflicting reports and statements from the pro-Kurdish and government media and politicians. The pro-Kurdish People’s Democratic Party (HDP) stated the government was not allowing ambulances in the area while the government said the ambulances cannot get close because the Kurdish militants do not allow them. “Nobody can claim that Turkey broke the law while fighting against terror,” Prime Minister Ahmet Davutoğlu has said on January 28 and added: “We fight against terror and we would take all kinds of measures to rush any wounded person to hospital, no matter whether [he or she] is a terrorist… But if ambulances wish to reach there, then terror elements there should immediately get out.” Kurdish lawyers approached the European Court of Human Rights but the court decided it is a domestic law matter. The operations at Cizre were declared to be at an end on February 11. A leaked video from February, featuring Presidental Advisor Mustafa Varank discussing pro-Hizmet channels to be removed from the TURKSAT sattelite with pro-government journalists at a TV studio has surfaced. 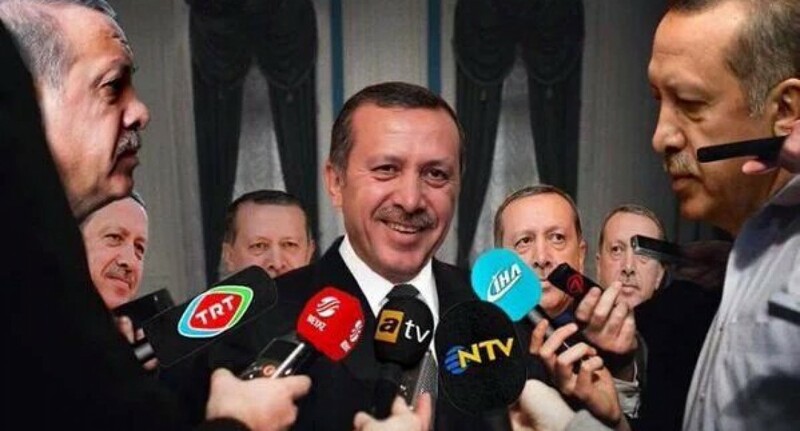 After confiscating the undistributed issue of the Nokta magazine with the Erdoğan selfie cover, blocking access to noktadergisi.com, blocking access to a story about leaked meeting notes from the AKP officials, the government practiced “preliminary censorship” on Nokta by presenting a court order that what kind of news they will not be able to report. The mentioned meeting notes were part of a series but Nokta reported on October 21 that they received a court order that says they cannot continue to publish the alleged notes. Nokta also stated that the police confiscated their magazine’s latest issue from some central newsstands in Istanbul without a court order. Diken reported: A trial started against police officer S.G. for breaking the nose of Dicle News Agency (DİHA) reporter Feyyaz İmrak as he was covering a protest event. The cop is on trial without arrest and faces a year of imprisonment if found guilty and pleads not guilty. Cem Küçük, pro government journalist who is famous for threatening colleagues and recently questioned by the police regarding the attack on Ahmet Hakan did it again. Küçük threatened CNNTürk news presenter Nevşin Mengü with ending her journalism career. Küçük has testified that his previous threats to Hakan were “irony,” not threats. During a daytime live TV debate, Küçük claimed Hakan has published his adress and other private information in his column (not true) and Mengü showed that newspaper clip on CNNTürk. “Mengü will see… I will end her life in media” Küçük said. Mengü said she welcomes the challenge. The prosecution has objected to the release of the six out of seven suspects regarding the investigation on the attack on journalist Ahmet Hakan. The higher court rejected the appeal on Wednesday. Pro-government Sabah and its sister publication the Daily Sabah in English accused the rival media group Doğan with being hypocritical about press freedom due to the insult and defamation complaints Aydın Doğan has filed against pro-government journalists. “Journalists critical of Aydın Doğan and media groups including Daily Sabah’s parent company Turkuvaz Medya face a barrage of lawsuits by the media magnate and his news outlets seeking the imprisonment of journalists in a move criticized for hypocrisy as Doğan complains about the lack of press freedoms” Daily Sabah argued. “The nine suspects who were sent to court over the allegations that they deliberately neglected intelligence that led to the 2007 murder of Hrant Dink, a renowned Armenian-Turkish journalist, have been released on Thursday” daily Sabah reported. “Daily newspaper Sözcü’s Necati Doğru has become the latest journalist in Turkey to be found guilty of “insulting President Recep Tayyip Erdoğan,” sentenced to 11 months and 20 days in jail” Hürriyet daily News reported. The sentence is transformed into a monetary fine. “Anadolu Agency photojournalist Saleh Mahmoud Laila was killed in a suicide car bomb attack in Syria on Thursday” AA reported. Engin Dinç, the head of the National Police Department’s Intelligence Unit who led the Trabzon Intelligence Unit at the time of the murder of Turkish-Armenian journalist Hrant Dink in 2007, said in recent testimony to the İstanbul Public Prosecutor’s Office that the intelligence on Dink’s murder was passed to the İstanbul Police Department in February 2006. The daily Milliyet reported on January 26 that artisan T.G. who blamed murdered newspaper distribution staff Kadri Bağdu for damaging his shop earlier is a murder suspect in another investigation and believed to be fled to Syria. A man named Yusuf Güldiren was murdered on October 10, 2014 during riots in Adana. The police have tracked a vehicle believed to be used in the act to the shop of T.G. who has blamed Bağdu for damaging his shop in the same riots. According to the Milliyet story, the police believes T.G. has fled to Syria with his sibling to join the ISIS. Relatives of the siblings have testified to police that they were worried about being arrested due to Bağdu’s murder. A third arrest is reported today in scope of the Hrant Dink murder investigation. Cizre police chief Ercan Demir was assigned 11 days ago to his current position which caused riots in the city and resulted in five civilian deaths. The Istanbul court which hears the restarted Hrant Dink murder trial ordered arrests of two policemen. Daily Azadiya Welat staff Kadri Bağdu was murdered in Adana on October 14, 2014. Online newspaper Radikal published two stories by reporter İsmail Saymaz about the developments in the investigation on January 7, 2015. The first story, “All neighborhood saw the murderer with the red helmet but the 52 cameras did not,” reports that the police could not find any recording of the motorcycle riding assailant who shot Bağdu on the hard drives of the 52 security cameras at the area despite there are eyewitnesses who saw him before and after the attack. The police also stated that they investigated many motorcycle owners in Adana but found nothing. Bağdu family lawyer Tugay Bek says he does not believe that the murder will be solved. Bağdu was distribution staff for the Azadiya Welat and also distributed the daily Özgür Gündem. Both dailies are pro-HDP/KCK and the family believes the party’s and organization’s fundamentalist rivals committed the murder. Meanwhile, eyewitness claims show that the trigger-man wearing a red helmet and riding a black and red motorcycle was alone. The first reports have claimed that there were two people on the motorcycle. The second story, “Do radical Islamists have a hand in the murder of journalist Bağdu,” is about an artisan blaming Bağdu for damaging his shop during the riots in Adana. There were street riots in Adana on October 6-8 alongside other cities in Turkey regarding Turkey’s Syria policies, especially about the Kobane clashes. The police was questioning people about another murder occurred in Adana during the riots and and artisan identified only as T.G. claimed that Bağdu was among the people who pillaged his shop because he is a religious man. This testimony was given two days before the murder and now is a part of the murder investigation. Lawyer Bek says T.G. owns a motorcycle which fits the description of the model and the color of the motorcycle used as the escape vehicle as seen in the photos on T.G.’s Facebook page. Bek also claimed T.G. is a fundamentalist who should be investigated as a suspect. Gazeteci Bağdu cinayetinde radikal İslamcı parmağı mı var?